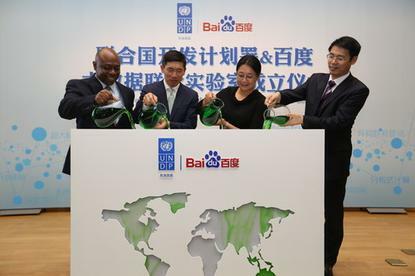 Baidu launched its Big Data joint lab with the UNDP on Monday. The Web-based app called "Baidu Recycle Station" launched Monday as part a new joint lab established by the Chinese company and the U.N. group. The lab will use Baidu's Internet services and data analytics to develop programs targeted at helping the environment, health care, education and more. Baidu has already been working to analyze data from the Internet for applications as various as forecasting flu outbreaks and predicting the outcome of the World Cup. In developing the recycling app, Baidu is tackling China's considerable e-waste problem. The country is the second largest producer of electronic trash, creating over 3.6 million tons of it each year, according to a U.N. study.